MEMS inertial sensors from distributor Farnell element14 now include the closed-loop Gypro series from Tronics Microsystems. According to the distributor this series takes MEMS gyros to an unrivalled level of performance for applications such as precision navigation, motion tracking and control and optical stabilisation. The MEMS gyros from Tronics Microsystems, a division of TDK that manufactures standard inertial sensors and custom MEMS products, address new customers and applications on the high-end side of the motion sensing sector. The MEMS inertial sensors are suitable for system manufacturers with strong requirements for high bias stability and high-performance inertial sensors. Key applications include precision navigation, motion tracking and control, and optical stabilisation. Benefits are in terms of size, weight, power and price, without compromising on performance and reliability, says Tronics. The Gypro series features bias instability of only 0.8̊ per hour and low noise (angular random walk) of only 0.14 degrees per square root h. The standard GYPRO2300 MEMS inertial sensor features a data rate of 200Hz with RMS noise [1.0 to 100Hz] of 0.02 degrees per second. The GYPRO2300LD offers a data rate of 1700Hz at two milliseconds latency and is tailored for motion tracking and stabilisation. The GYPRO3300 boasts improved tolerance to harsh environments (vibration rectification coefficient of 0.5 degrees /h/g²) and a latency of one millisecond due to improved integrated circuitry, tailored for precision navigation and stabilisation. The built-in closed-loop electronics brings advantages such as superior linearity, increased signal to noise ratio and improved behaviour in harsh vibration, shock and temperature environments, says Farnell element14. In addition to the portfolio of high performance MEMS standalone gyros available for same day shipping, Farnell element14 also stocks Tronics Gypro-EVB2 evaluation kits which are specifically designed to interface with the Arduino YUN open-source electronics prototyping platform. 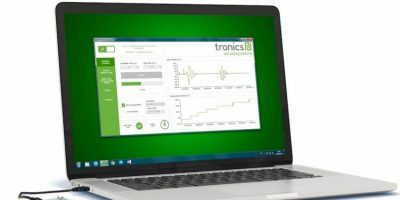 They are compact in design and integrate the Tronics proprietary evaluation software to help design engineers test and develop Tronics standard high-performance MEMS gyros into their own designs.